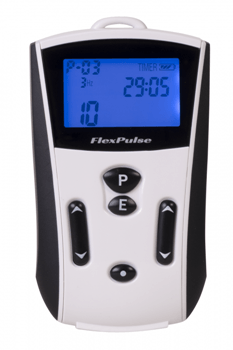 The FlexPulse™ is a brand new portable PEMF system. Made in Germany, this device has a relatively high intensity and variable frequency sets to help cover a wide range of health needs. There are 6 programs, for use with everything from pain to sleep to mood stabilization. Its rechargeable battery and LED screen make it very easy to use. Designed and manufactured in Germany, the FlexPulse™ contains a unique regenerative signal while also layering different frequency bands and programs together to create a truly flexible therapeutic device. The FlexPulse™ is unique from other PEMF systems because it was developed based on more than 15 years of stem cell research, alongside decades of brainwave entrainment research. By increasing our body’s production of stem cells, the FlexPulse™ allows for true regeneration to take place, safely, naturally, and without side effects. Specially selected brainwave entrainment frequencies mimic the patterns of the brain to help you become alert or feel relaxed, based on your needs at the time. Unique from other PEMF therapy device because it was developed based on more than 15 years of stem cell research, alongside decades of brainwave entrainment research. FlexPulse™ is compact and can easily be placed in a pocket or strapped to an armband. The applicators release the magnetic field, and should be placed on the area of the body where treatment is required.